So, the Knicks have practiced! They must be awesome now. After the goofy, giddy madness of Wednesday night, the Knicks head back tonight to play the Cavaliers in Cleveland, the site of their most demoralizing loss of the year back in December. (After that win, the Cavs lost approximately 423 games in a row.) It almost seems like drudgery to have to go play a road game tonight in front of a disinterested crowd and a surely-already-eating Baron Davis. That should be beneath the Knicks! They are having too much fun for an Eastern Conference game! This game should be on the moon! This of course means they'll probably lose. The Knicks don't quite have their roster together; it's possible that this weekend, when they play the Heat opposite the Oscars in a game that just became a LOT more fascinating, they'll have old pal Jared Jeffries in the rotation. Jeffries could be back! Isiah MUST be around. 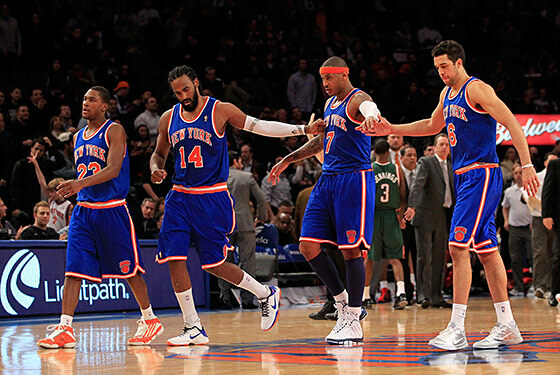 It's strange thinking the Knicks have only 27 games left before the end of the regular season, isn't it? The All-Star break comes so late in the NBA that you forget that the season's darned near almost over. The Knicks have a 93.5 percent chance of making the playoffs as of this second, which is a good thing, because if they missed the playoffs now, even Landry Fields would cry. It's just disorienting, really; everything happening so quickly. The Nuggets, featuring Wilson Chandler, Danilo Gallinari, and Raymond Felton (but no Timofey Mozgov) looking strange in Denver jerseys, beat the Celtics last night and could legitimately end up with home-field advantage in the first round of the playoffs. The Celtics are trading their terrifying centers. Deron Williams is with the Nets. And the Knicks are the center of attention in New York even when spring training is starting. It's a lot to keep up with. It almost seems wrong to have to slow it all down for a game in Cleveland. It's all so much lunacy right now. They should be playing on Gilligan's Island right now. It's all just a cartoon. We're not caught up yet.